Crystal and her icy doppelganger in Cirque du Soleil Crystal. Photo by Matt Beard. So I went to see Cirque du Soleil Crystal, the latest creation from the Canadian company known for reinventing the circus in ways the Ringling Brothers could never imagine, in ways that led the way for a new age of arena spectacles and which has become an empire onto its own. Cirque’s 42nd original production since 1984 (the year, not the book) involves Crystal, a young woman living at home with her parents in a stifling suburban existence. She’s an outcast at school – not one of those black-clad goth kids, even, or a computer nerd, but just a someone off in her own orbit. In her world, apparently no one has a mobile phone. Her family still watches TV together. And the white collar workers carry briefcases. Nobody is staring at a computer or a smartphone. Weird. Of course, in the audience, no matter what type of performance you attend, there’s always someone making a video with a phone, until the usher tells them to stop. Then they do it again. Because life isn’t worth living unless it’s posted on social media. Back to the story. 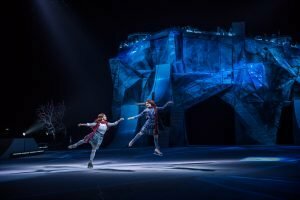 Cirque calls the show a breakthrough, and on one hand that’s a pun, because Crystal breaks through the ice skating one day. Before hypothermia sets in, she enters a magic world that includes her shadowy doppelganger. Even though it’s under the ice, there are no fish, but lots of skaters and acrobats. That’s the other breakthrough, the mixing of Cirque with skating. 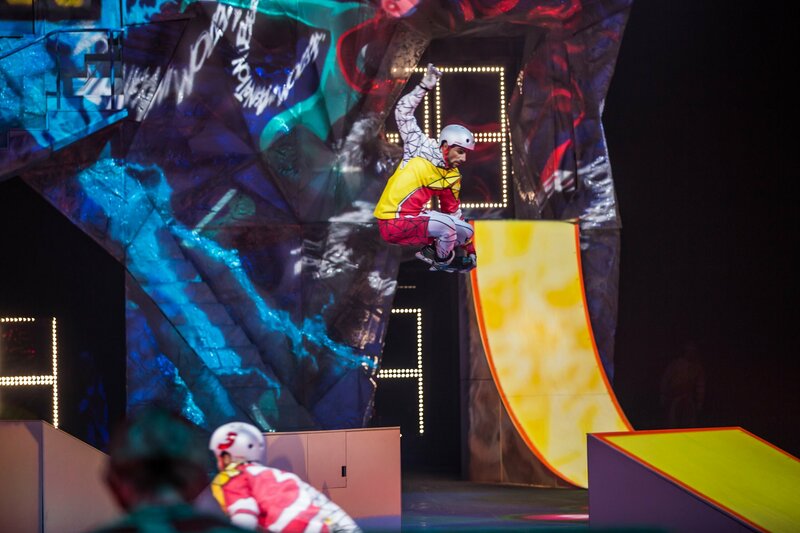 And it is impressive to see acrobatic and clown routines combine with skating. The one thing I could have done without – the inclusion of a song by Sia. Sia wrote the more annoying song, ever, that brainless Rihanna hit, Diamonds. Sia allegedly bragged it took her just 15 minutes to write Diamonds, which is about 14 minutes longer than it should have taken. For Diamonds alone, Sia should never be forgiven. But on with the show. In one piece, Crystal takes to the skies, in skates, to perform a death-defying number above the rink. I can’t even keep my shoes tied, so I was very amazed. The Tron-tastic hockey scene n Cirque du Soleil Crystal. Photo by Matt Beard. Another showstopping number comes at the end of the first act, where for some reason, Crystal imagines hockey taking place on the rink. The shoot-around involved players who look like extras from a yet-to-be-made Tron sequel. The puck winds up being discarded for shiny metallic spheres, and the hockey players wind up doing tricks akin to what you see skateboarders and snowboarders do. It is very impressive, particularly to someone who sometimes has trouble getting his key into the ignition and hates when he has to wait for the defroster to remove the ice from his Camry windows, November through March. Anyway, for some reason, the hockey bit is scored to Celtic-style music, the kind you hear in Riverdance and other such productions. Maybe Crystal is from Nova Scotia. There’s also a guitar solo with the Celtic music, so who knows? Either way, the “wow” inducing hockey segment gave me an idea: Riverdance on Ice. Imagine feet of flames searing through the frozen Liffey as step dancing comes gliding across arenas the world over. I just hope the Flatley-ish lead buttons his shirt, because a fall could mean his belly would stick to the ice. Adding skating could bring excitement to any number of theatrical experiences – but for the dramas of Eugene O’Neill which are long enough already. Scotch on the Rocks Putting a Highland games on ice would be a natural tie-in for any whisky brand to back the show. Plus, how death-defying would it be to have skating bagpipe players wearing kilts the proper way? Talk about a close shave! And caber tossing on ice would be sure to make the ESPN highlights. Drum Corps on Ice Precision marching, drills teams, drums, horns and skaters actually seems like something you might see at a drum corps show these days. Scarface: Snowfall Gangsters and gunplay means blood on ice, and Scarface already has more snow than any mob pic. Perry Mason: The Deadly Blade Any procedural crime drama could be livened up by setting it at an ice rink, so why not go old school? Game of Thrones: Beyond the Wall The actual title of the series of books that serves as the basis of the HBO dragon drama is A Song of Fire and Ice, so this is a natural fit for an ice show. Instead of fire, though, I’d make half the rink a pool and somehow involve former Olympic swimmers along with White Walkers. Make that swimming White Walkers. How awesome would that be? Plus, there be dragons. Pink Floyd: The Wall PBS would love this, a skating spectacle set to the classic Pink Floyd album as performed by an Australian cover band or maybe Celtic Thunder. It would become a pledge drive perennial. Charlotte’s Web on Ice How cute would it be to see a pig on skates? How cool would it be to see an eight-legged spider skate? Or maybe a Zamboni could play the spider! Breakin’ Ice So there actually was some ice break dancing in Crystal, but a whole hiphop night would be boffo box office and revive the careers of Kid N Play. Star Wars: Rink Planet There’s Star Wars everything, so why not an ice show? I draw the line at superheroes, though. We don’t need anymore superhero anything. Titanic To mark the 20th anniversary of the soggy movie, maybe this could be told from the perspective of the iceberg. As long as the Leo DiCaprio character dies in the end, I’d be fine with it. Barry Manilow presents the Copacabana in Copenhagen Really, this would be sort of like that Jimmy Buffett Margaritaville musical, which is to say for old people who love the 70s, but way more fabulous and with showgirls, sentimentality, sequins and Danish ski jumpers. Hamilton On Ice Just imagine Alexander Hamilton duelling Aaron Burr on a frozen pond with pistols – after an ice dance skate-off flashback – and you know why this would melt the hearts of history buffs! 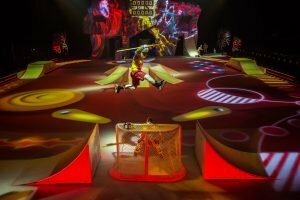 Cirque du Soleil Crystal has a hockey segment scored to Celtic music, which inspires thoughts of staging all sorts of ice shows. Photo by Matt Beard. ← Chicago flag comes home to Westport!